In one of the most exciting soccer finishes imaginable, the 49ers have won the conference title, and the chance to host the Big West tournament. Photo courtesy of Lisa Beth Anderson. 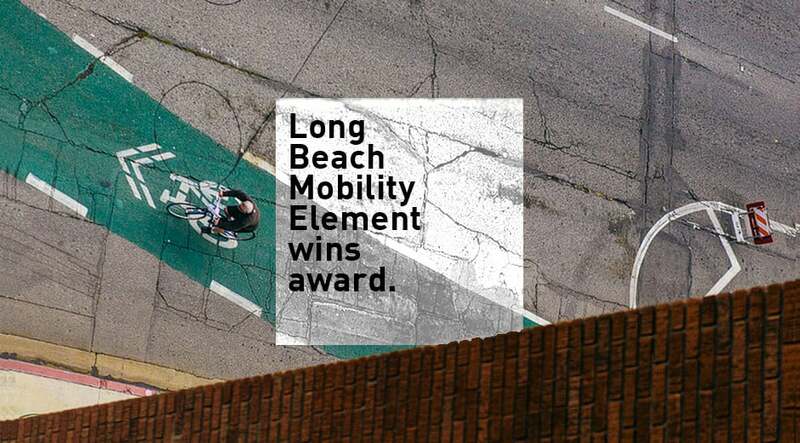 After six years of development and a few decades after its last update, the City of Long Beach’s “Long Beach 2030” Mobility Element (ME) earned an Award of Excellence by the Los Angeles Chapter of the American Planning Association (APA). Last October, the Planning Commission forwarded the document (which dictates the way in which the city will enact mobility policy over the course of the next 20 years) to the City Council, who approved it and adopted it into the city’s General Plan. The new ME addresses the function of the street, neighborhood character, and the needs of all mobility users. This approach lends itself to a more balanced mobility system that also integrates land use and urban design objectives for better place-making. The update to the ME was largely headed by mobility expert Ira Brown, who was a part of the previous 1991 ME. The Element has to take into consideration a multitude of legislative acts which involve the planning and development of mobility systems within Long Beach: The Complete Streets Act (AB 1358) that generally assures that all types of roadway users are considered in planning; a Sustainable Community Strategy as required by SB 375 that focuses on reducing greenhouse gases; consistency with the General Plan, including Long Beach’s optional elements (Historic Preservation, Seismic Safety, Air Quality, and Local Coastal Program). Finally, since Long Beach is a coastal city which has a certified Local Coastal Program, the ME has to adhere to the four requirements of said program: increase reliance on public transit; decrease reliance on automobiles; provide more parking; increase ped/bike access. Long Beach, like Los Angeles, is mostly built-out with right-of-ways that are either difficult or impossible to expand; in this sense, the updated ME focuses on a desire to make the existing mobility network more efficient. Though the 1991 ME was rather ahead of its time—largely seeking to reduce single-occupant automobility—it mainly focused on making the street network safe and more efficient for private automobiles while largely ignoring a larger investment in transit, pedestrian, and bike access and infrastructure. There is not some utopian dream in the updated ME of eradicating autos in SoCal more than there is a desire to decrease single-occupancy of autos for everyday travel. In this sense, the emphasis was on the growing trend car-sharing, “neighborhood” cars, and the development of a network of charging and alternative fueling stations throughout the city. One of the examples provided was the newly added Boulevard street type, which reflect roadways “characterized by moderate speeds, a balanced multimodal function, wide sidewalks, and more intensive land use oriented towards the streets.” This makes the updated ME “leapfrog” in nature: one piece corresponds to the next, creating a network in which each piece depends on the others for its efficiency. This policy, as noted by the APA, is fascinating because, for example, it doesn’t necessarily remove regional corridors or arterials from their original purpose but simply realigns them to have a specific role and identity that contributes to the betterment of its surrounding neighborhood. In turn, this leads to a wider pedestrian plan within the updated ME, focusing heavily on increased pedestrian capacity and amenities, including more efficient connections to other modes of travel and open spaces, and increasing the temporary closure of streets for activities (block party, anyone?). This then leads to a larger bicycle safety and connectivity: a designated system of Bike Boulevards (e.g. Daisy) with more amenities, a closure of gaps in existing bikeway system, and actively supporting ciclovías. Like its 1991 counterpart, the plan has a main goal of increasing transit for work and non-work missions. Of course, many transit advocates know this is easier said than done since the ME played the same tune in ’91. However, there is a more logical, common-sense approach in the updated ME: include arrival times at all stops and on all buses, include Long Beach Transit more directly in Site Plan Review processes while also supporting Transit’s efforts to create a universal access pass, and continue to drive support to extend the Metro Green Line to the Willow Blue Line Station. This then all leads to its focus on the automobile. Given we live in Southern California, many are embedded in a culture fueled by fuel-driven machines that, even for some of the most progressive folk, are simply hard or impossible to give up. However, like in ’91, there is not some utopian dream in the updated ME of eradicating autos in SoCal more than there is a desire to decrease single-occupancy of autos for everyday travel. In this sense, the emphasis was on the growing trend car-sharing, “neighborhood” cars, and the development of a network of charging and alternative fueling stations throughout the city. This is the second consecutive year that Long Beach Development Services has been recognized by the APA. The Downtown Plan received an award for the 2013 Comprehensive Plan, Large Jurisdiction; and an Award of Merit for the Comprehensive Planning Award – Large Jurisdiction at the 2013 State APA Conference. This article originally appeared on the Long Beach Post.